Among other things, Ra.One has been labelled as Shah Rukh's most expensive midlife crisis. Perhaps there is some truth to that, feels Abhishek Mande. Anyone, who has written about India in the last 10 years, will probably tell you about the 'two Indias' -- one that is leaping and bounding towards the future, eager to embrace everything that is new and the other that continues to be tied down by archaic traditions, refusing to adapt. One wouldn't be entirely incorrect if one says the same about Shah Rukh Khan's Diwali release Ra.One. Starring Khan alongside Kareena Kapoor and Arjun Rampal, Ra.One, on the one hand, has special effects that no Hindi movie can boast of so far, but on the other, it is saddled with an almost 1990s-style treatment with songs popping out of nowhere and dialogues that make you cringe. Even as Shah Rukh Khan flies over buildings, jumps over cars and even stops an out-of-control train with his bare hands, his valiant efforts to wow his audiences somewhat fail thanks to a weak storyline, some rather juvenile acting and a poor screenplay. To make matters more unbearable, the dialogues go from bad to worse and Vishal-Shekhar's music -- barring a couple of numbers -- has little to offer in a film that could have possibly ushered in an era of science fiction cinema in mainstream Bollywood. In a sense, Ra.One is a modern-day retelling of Frankenstein. A young boy (played rather well by debutant Armaan Verma) tells his techie father Shekhar (Shah Rukh Khan) to create a super-villain (played by Arjun Rampal), who isn't just evil but also invincible. The nerdy father, who heads a gaming division of a company, gives him just that not realising what he's unleashed upon the world. Ra.One, you see, is a video game named after the antagonist in it who, because of the artificial intelligence programme (and a process too complicated to understand) designed into him, manages to break out of the virtual world and step into our world. Needless to say, much havoc ensues and Shekhar's son Prateek manages to find himself in the eye of the storm and on the run from his evil nemesis who can take the form of anything he sees or touches, quite like T-1000 from Terminator 2: Judgement Day. The allusions to popular sci-fi movies don't end here. There's a bit of Bicentennial Man with Sonia (Kareena Kapoor) falling in love with G.One, the boy that has the face of her dead husband and protects her and her son from a seemingly inevitable end. And there's even a hint of Matrix with trench coat-sporting characters cricking their necks before delivering punches. The list can go on but what makes Ra.One such a drag is that through all of this, you're never once able to relate to any of the characters in the film let alone anything else. Sci-fi movies do require a certain willing suspension of disbelief, but the makers of Ra.One demand a heck of a lot more. They seem to expect their audiences to take a blind leap of faith and hope that the charisma of one of India's biggest stars manages to hold the movie together. Sadly and somewhat predictably, it doesn't. Ra.One is one long disjoined chain of events and scenes that aren't just half-baked, but also lackadaisically connected with the seemingly sole purpose of being able to show the (almost) 46-year-old actor performing some breathtaking stunts. Shah Rukh Khan is arguably one of India's greatest stars. For most part of his career, Khan has had us eating out of his hands playing the inimitable lover. When his boyish charm and baby fat went away, Khan transformed himself into a cheeky hero akin to the character he played in the second half of Om Shanti Om, getting away by saying and doing the darndest things. Ra.One is Khan trying to reinvent himself yet again, this time as an action star, a dream that I am told he's harboured for the longest time. It isn't surprising that his next film set for an Xmas release is Don 2, the action-thriller where he plays a dreaded underworld don. And even as he looks promising in it, his role in Ra.One leaves a lot to be desired. For the entire first half of the movie, we see Khan as a bumbling father who talks in a rather cliched south Indian accent, eats noodles and curds with his hands and hopes to gain his son's acceptance by doing everything from dressing up in tight leather pants to even going to the extent of creating an invincible villain for him. If, by making him do all of this, director Anubhav Sinha hoped to make Shekhar lovable, I am not sure he succeeded. It is only much later, almost closer to the intermission that we see Shah Rukh Khan's 'action avatar'. Here, in one particular shot Khan as G.One is perched atop a broken car against a London skyline. His intense look and poise sparks a glimmer of hope in a movie that promises to be a dreadful watch. Unfortunately, it lives up to this promise and everything from there is a downhill ride despite all the special effects and some rather cool action scenes. Which brings me to the SFX. There is no doubt that the effects we see in Ra.One are the best in Bollywood yet, but to say that they're comparable to the Western standards would probably be an overstatement. Ra.One seems to have been put together rather half-heartedly -- a song forced in here, a handful of laughable special appearances there (including an unforgivable one of Superstar Rajinikanth) and a little slapstick comedy and rona-dhona thrown in too. In the weeks before its release, Ra.One has been called many things. Among them, it has been labelled as Shah Rukh's most expensive midlife crisis. After watching the movie, it seems to me that perhaps, just perhaps there might be some truth to it after all. 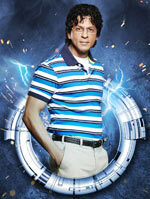 Reader's Special: REVIEW Ra.One here! 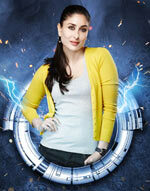 Has Ra.One made its money?